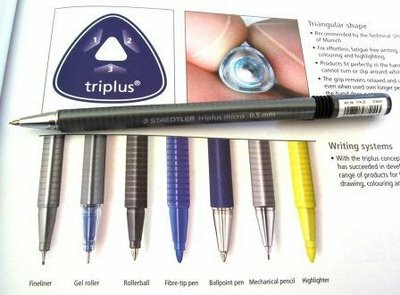 The Staedtler Triplus “writing system” consists of a large selection of writing instruments – ballpoint, rollerball, fibre tip, mechanical pencil, highlighter, etc. I quite like the look of the Staedtler Triplus Micro mechanical pencil. Its an aesthetically pleasing package – long thin triangular shaped body, grey plastic with a slightly metallic looking finish, light grey bands around the body, chrome tip, straight pocket clip, black concertina section at the top – it all goes very well together. Remember I have a bit of a history of not liking the ‘Staedtler look’; well this time I do. An obvious point of difference about the Triplus Micro is its triangular body shape. This is becoming more common in woodcase pencils, but is a bit rarer in mechanical pencils. It feels good in the hand, easy to grip. There is no particular grip section or grip enhancement so you can hold it wherever you like. The stripes around the body might look they are something to do with the grip, but they are just pure decoration, but I like the look! Overall though the grip is not the best, the surface of the body is smooth and it did get a little slippery after extended use – not bad, just not great, so overall a ‘pass’ rather than a ‘above average’ grade for the grip. The balance point of this pencil is close to the tip. With long length and a low balance point this pencil feels quite light in the hand – going for that old fashioned quill ‘light as a feather’ approach? The lead sleeve is a conical cone so it’s for general writing only, not draughting. It is retractable, so it is fully pocket safe. The lead advance mechanism is a push top ratchet. Mine is 0.5mm lead, but there is also 0.7mm. The pocket clip looks good but isn’t all that great, about average as far as simple moulded plastic ones go. Now for the eraser – it’s one of those twist out ones, with about 15mm (5/8th in.) of usable length and is 6mm (1/4 in.) diameter. It’s a very good eraser, exactly what I would expect from Staedtler who I regard as leaders in the field of erasers. The whole top from the black concertina section up, pulls off to give access to the lead magazine. It’s only a narrow tube so you can’t store too many spare leads in there. The top section is a friction fit onto the lead tube which I’m always a little dubious of re life-expectancy. If the top section started falling off then the pencil would be pretty useless. Overall this is a good pencil, no, it’s a great pencil, better than the Faber-Castell Grip 2011. Obviously the 2011 has better grip, but the Triplus Micro is ahead on everything else. Any serious fan of the mechanical pencil needs to try this one. In my review of the 2011 I said, “If you are a pencil person, you need this pencil.” Well it’s true for the 2011 and it’s even more so for the Triplus Micro – go get one today. Best Points – The decent eraser, the auto-advance, the ….., just about everything really. Not So Good Points – The grip isn’t the best. Price Range – Economy / Low. Dimensions – Length 151mm, triangular body is 9mm along the sides. Balance point about 65mm up from the tip. 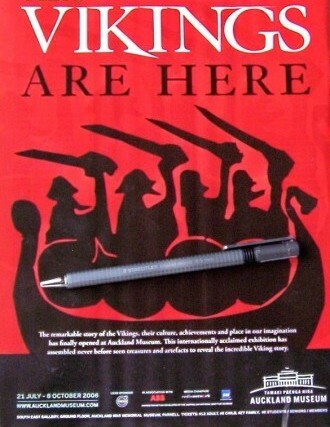 Note: Thanks to reader Henrik Neble from Denmark for making sure I got around to reviewing this great pencil. And just in case by some amazing coincidence they ever trip across this blog, hello to my long lost friends from Denmark – Inge, Liv, Malika. Yes, it’s me - Dave “S and K”. I notice that PencilThings.com calls it the "Staedtler Triplus Micro Automatic Pencil". I need to see if someone around here carries them; I hate shipping charges that are twice the cost of the item. Yes, many names for pencils that aren't wooden. When I was young they were called propelling pencils or clutch pencils. Thats still probably their "official" name in New Zealand because thats what you categorise them as on NZ Customs documents. I think propelling is the British term, and mechanical or automatic a more US term. 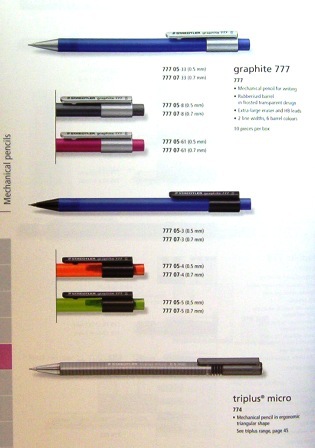 Personally I changed to mechanical pencil a few years ago, and thats the term now used in most catalogues, ads, etc here in NZ. 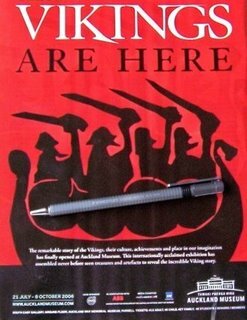 I've got one of those here - our friends at Cult Pens sent us one (doesn't look like they've got the pencils at the moment, just ballpoints and fineliners). I wasn't all that impressed, presonally. I found it a bit thin, and I thought it felt a bit 'cheap'. I'm not so keen on the softer-feeling plastic it's made from. The eraser is excellent, though - I was quite surprised to find a twist-to-advance eraser on it. As far as I can tell, it isn't advancing automatically - it's just that the paper pushes the sleeve back when the lead gets too short. We definitely prefer the Faber-Castell Grip Plus, but only if you don't mind the chunkyness. Yeah you're right. I'm a moron and I'm off to go boil my head. It's a sliding sleeve. I don't know whats wrong with me. I've got auto-advance on the brain and I'm mixing the two together these days. What a stuff up - and in print for the world to see! Maybe I should just delete this whole post and deny it ever existed. Just as well this isn't my real job! Still I know what you mean about like and dislike. The things you think make you like one pen/pencil/thing mean nothing when it comes to another pen/pencil/thing. I guess its an emotional response and logic isn't that big a part of it. Hmm. I'm not sure what I *did* mean by soft plastic now. It still feels like it's soft to me, but it really isn't, is it? I'm thinking in comparison to the Mars 780, but it isn't actually any more bendy, just feels different. I'm sitting here now with the Mars 780 and the Triplus. I love the 780, but I just don't like the Triplus, and I can't form a reasoned argument *why*. If I ever get around to reviewing it, it will make a great example of how individual tastes differ. I bought the Triplus Micro about 3 months ago. To my dismay, the pretty stripes around the body are wearing off rapidly (onto my fingers). I don't think my hand gets unusually sweaty while writing, so this was quite a disappointment. The pencil looks all tattered and dirty now, just from regular use. Otherwise, I'm pretty happy with it. It's not very sturdy, generally speaking, but it was pretty cheap. Maja - might be worth complaining to Staedtler and asking for a new one. I have noticed a lowering of the price-point around here in local stores, definitely in the "economy" rather than the "low" price range. Have you noticed that they put some kind of metal weight un the barrel to make it heavier, give a look inside your barrel to see it, it explains why this plastic pencil felt a little heavier than what I expected when I picked it up. I like this pencil - super smooth writer and feels good in the hand. The clip is very cheap and I modded it with a junior hacksaw to reduce its length to just above the cushioning area. As a pencil turner (and this pencil is perfect for turning with its three sides)the clip kept catching the base of my index finger. Great eraser just behind the Staedtler Graphite 771 in usefulness. Sliding sleeve reasonably effective. Anyone know where I could find one of these in America. I can only find European shippers and it is expensive. I ordered these from Stationery Art out of Hong Kong. Immediately after I began receiving many spam messages on my e-mail account. Just as quickly someone began using my e-mail account to send spam messages to everyone on my contact list. I don't know for sure but I wouldn't risk using that source for purchase again. I was quite impressed with the lead supplied with my Triplus Micro 0.5. I prefer softer leads for general writing, and this one seems to be softer, denser, and have a nice feel to it, what I think they call "tooth." You can really feel the paper sandpapering it off, as it were. Three months ago (9/10/2010), I bought 6 Triplus Micro pencils. I now have 2 left. where solid plastic becomes two vertical strips. who erases with a heavy hand. This also happened to me twice, each time after 1 month, as I carried the pencil in my pant pocket. Additionally, under pressure, the eraser snaps down below the pencil housing. If I want the eraser retracted, I would rather turn the eraser mechanism (as designed). many books get a smudge of lead and eraser. The eraser seems to interact with some paper coatings. Nonetheless, I use the Triplus Micro's eraser several times on my daily train commute, so I buy 6 more Triplus Micro 774 pencils today. I got a triplus micro as a gift. It has a problem with the tube that holds the leads.The tube is moving around, causing the leads to break quite often. This is a shame for the triplus micro lays very good in the hand and is fun to write with. I always loved my Zebra M-301 for the thin barrel, fixed lead sleeve, easy clip and non slip barrel. Have been looking for a long time a replacement for it but also found I really HATE the eraser on Zebra M-301 due to its size and easy to get stuck when running low. Decided to go with a Twist Erase III which learned I MUST get a thin barrel or hand fatigue is gonna hurt! Came up with the Pentel Twist-Erase GT which seemed perfect... on paper. The clip will NEVER let you clip on anything! Its so tight and rigid. The grip is another nightmare, you CANT slip this in a pencil hole like from a binder, backpack or even a pen sleeve because the grip will stop it all. From a Papermate I learned I need fixed lead sleeve because most of retractable ones wobble and wiggle all around. Now I got 2 more to look for thanks to you. Just want to chip in, the other day I found and older version of this. Mars Tri 773. Finding myself liking it very much The con tip is plactic though and it is so light making the weight negligible. I suppose it is no longer being sold anywhere. I bought both 0.5 and 0.7. I was surprised by how much I liked this pencil. It has a nice look, and the rounded triangle barrel is really comfortable in the hand. I haven't had it for long, so I can't speak to durability, but the clip and eraser section does seem a little flimsy. Time will tell.